Their Majesties King Jigme Khesar Namgyel Wangchuck and Queen Jetsun of Bhutan Visit Bangladesh. On February 14, 2013, Their Majesties King Jigme Khesar Namgyel Wangchuck and Queen Jetsun of Bhutan arrived in Dhaka, Bangladesh for a five-day visit. For more information about the visit as well as to view photos please click here, here, here, and here. His Majesty King Jigme Khesar Namgyel Wangchuck of Bhutan Holds an Audience. On Tuesday, February 5, 2013, His Majesty Jigme Khesar Namgyel Wangchuck of Bhutan held an audience at the Royal Banquet Hall in Thimphu with various district governors as well as elected local leaders. Please click here and here for more information as well as to view photos. Their Majesties King Jigme Khesar Namgyel Wangchuck and Queen Jetsun of Bhutan Hold an Audience. Their Majesties King Jigme Khesar Namgyel Wangchuck and Queen Jetsun of Bhutan recently held an audience with “… the sixth batch of Desuups…” on February 3, 2013. Please click here for more information as well as to view a photo. His Majesty King Jigme Khesar Namgyel Wangchuck of Bhutan Meets With Mr. Rahul Gandhi in New Delhi. On January 28, 2013, His Majesty King Jigme Khesar Namgyel Wangchuck of Bhutan met with Mr. Rahul Gandhi, the Vice President of the Indian National Congress at the Taj Palace in New Delhi, India. His Majesty also met with General Bikram Singh, Chief of the Army Staff. Their Majesties King Jigme Khesar Namgyel Wangchuck and Queen Jetsun of Bhutan Attend the 64th Republic Day Celebrations in India. On January 26, 2013, Their Majesties King Jigme Khesar Namgyel Wangchuck and Queen Jetsun of Bhutan attended the 64th Republic Day parade and celebrations in India. Please click here and here to read articles, in English, as well as to view photos from today’s event. Their Majesties King Jigme Khesar Namgyel Wangchuck and Queen Jetsun of Bhutan Visit India: Day Two. Their Majesties King Jigme Khesar Namgyel Wangchuck and Queen Jetsun of Bhutan continued their seven-day visit to Bhutan on January 25, 2013. On today’s agenda for the reigning couple: A visit to the Gandhi memorial in Rajhat where they placed a wreath his tomb, a meeting as well as a reception with the President of India along with the Prime Minister of India, and much more. Their Majesties King Jigme Khesar Namgyel Wangchuck and Queen Jetsun of Bhutan Visit India. On January 23, 2013, Their Majesties King Jigme Khesar Namgyel Wangchuck and Queen Jetsun of Bhutan began their seven-day state visit to India. During their visit the reigning couple will attend the 64th Republic Day Celebrations on January 26, 2013, attend a meeting with the President of India, Mr. Pranab Mukherjee as well as India’s Prime Minister, Mr. Manmohan Singh, and more. News Regarding Their Majesties King Jigme Khesar Namgyel Wangchuck and Queen Jetsun of Bhutan. Her Majesty Queen Jetsun of Bhutan attended the “… closing ceremony of the second Camp Raven at the YDF Hall in Thimphu…” on January 22, 2013. To view more photos from the event please click here, here, and here. In other news, His Majesty King Jigme Khesar Namgyel Wangchuck of Bhutan will begin his seven-day state visit to India on January 23, 2013. His Majesty will attend the 64th Republic Day Celebrations and meet with the President of India, Mr. Pranab Mukherjee as well as India’s Prime Minister, Mr. Manmohan Singh, according to the Bhutanese newspaper, BBS. Their Majesties King Jigme Khesar Namgyel Wangchuck and Queen Jetsun of Bhutan attended a“… joint convocation of two Colleges of Education of the University of Bhutan (RUB)…” on January 7, 2013. Please click here to watch a video news clip as well as to read an article about today’s event. On Tuesday, December 25, 2012, Her Majesty Queen Elizabeth II and His Royal Highness The Duke of Edinburgh, along with Their Royal Highnesses The Prince of Wales and The Duchess of Cornwall, Her Royal Highness The Princess Royal, His Royal Highness The Duke of York, Their Royal Highnesses Princess Beatrice and Princess Eugenie, Their Royal Highnesses The Earl and Countess of Wessex and their daughter, Lady Louise, Mr. an Mrs. Peter Philips and others attended Christmas service held at St. Mary Magdelene on the Sandringham Estate in Norfolk. His Majesty King Jigme Khesar Namgyel Wangchuck of Bhutan Celebrates National Day. On December 17, 2012, His Majesty King Jigme Khesar Namgyel Wangchuck of Bhutan celebrated the 105th National Day held at the Changlimithang Stadium in Thimphu, Bhutan. Please click here to read His Majesty’s speech to his people (in English). On November 23, 2011, T.M.s King Jigme Khesar Namgyel Wangchuck and Queen Jetsun Pema of Bhutan arrived in London, England as part of their tour of the country. 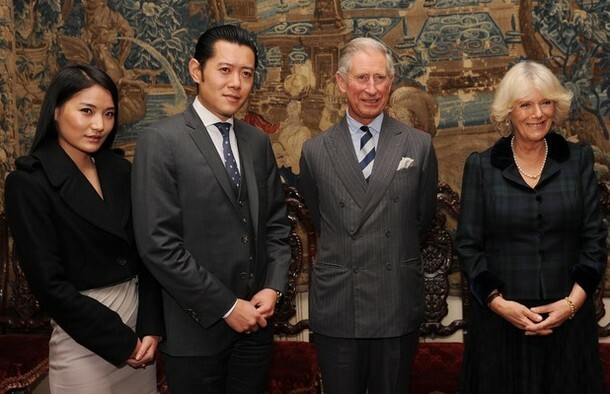 The reigning couple met with T.R.H.s the Prince of Wales and the Duchess of Cornwall this afternoon at Clarence House. It is unknown at this time how long King Jigme and Queen Jetsun will tour England. To view photos please click here.